The Kingdom of Amethonia is commited to aiding the truly needy people in other lands. For years His Majesty the King has used his personal funds to send the most basic of necessities to other countires, (e.g. pens, pencils, writing note books, and such toiletries as underclothes, tooth brushes and toothpaste. Hair brushes and other personal grooming items). His Majesty also sends personal funds so that some local villagers are able to purchase sacks of rice. Children holding up packs of white socks, toothbrushes, and toothpaste we shipped them. 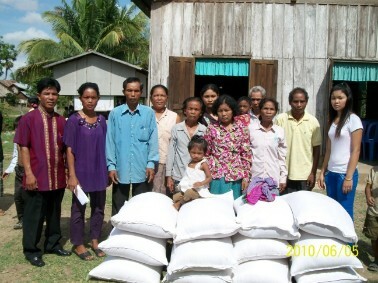 Church villagers standing behind sacks of rice purchased with funds received from us. Dispite our efforts there are still thousands of children, widows, and displaced persons living like refugees, without running water, or daliy source of food. They have no medicine. Many homes have no electricity, plumbing, or bathrooms. His Majesty also recognizes his citizens, as well as non-citizens for their selfless contributions, efforts, and compassion towards others in need.